Everybody knows that jogging is healthy. It provides body weight loss and fat burning, makes your body stronger and enduring, your figure well-set-up and slim, increases muscle bulk and doesn’t let cholesterol deposit on vascular walls. But unfortunately it’s not always fun, because systematical repetition of the same sport activity can bore one. Boredom brings laziness and you train less. Here are some recommendations to make jogging more exciting. First of all, choose different places for jogging. But don’t jog near roads, because during training you breathe more intensively and your lungs swallow up all exhaust gases from cars. It’s better to jog in a park or forest. Such places are more friendly also because if you are jogging on asphalt, all your body weight returns to your legs as a repulsive force from your every step and damages your joints, as asphalt is too hard to neutralize it. This means “Sore upon sore is mot salve”: you loose weight, but damage your joints. The best place for jogging is of course the race track in a green zone. When jogging you should also pay attention to your breath. The right way is to breathe in every two steps and breathe out the next two steps and so on in cycle. Moreover you should keep this breath method even if you make a pause. And during the pause you should not totally stop – walk with the same rhythm, so that your heart works in the same regime – this is healthy for you. And don’t forget to breathe the same way when walking, even if you are having a rest after jogging. Many women like to wear nice stuff, change clothes, we get enjoyment by combining things. Why not look good by jogging? Visit a sportswear shop and choose yourself what suits you best. Wearing comfortable sportswear you like during training provides a better mood and more energy, if you are sure you look attractive. A sport player should be comfortable: small, light and attachable. It should also be easy to use, so that you don’t have to stop training to switch between tracks and stations. A sport mp3 player should not impede your training. The best variant would be if you didn’t notice it during going in for sport. Choose the right sport earphones which provide a secure and comfortable fit during sports. By the way, what you listen to is also important. Upload songs of different styles to your mp3 player for your every mood and tempo. For those who doesn’t want to waste time, there’s also a genius and at the same time a simple idea to learn foreign languages during jogging. You can upload an audio book or audio language course on your sport mp3 player, then rhythmically burn fat and enjoy the freshness of the forest air simultaneously. So, listen to good music, feel comfortable, wear nice clothes, train with friends, jog with fun and be a genius and sporty beauty. No workout gear is complete without a pair of extra-durable puma shoes to enhance your workout. 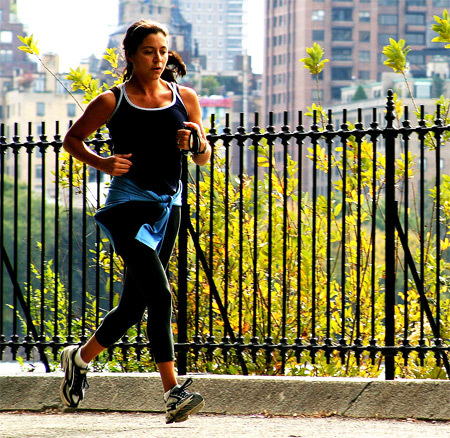 If you’re new to jogging, you will need a jogging plan for beginners to start with. Source of the image: flickr.com/photos/mikebaird, flickr.com/photos/thomashawk. Extremely interesting blog post thank you for sharing I have added your website to my favorites and will check back 🙂 By the way this is a little off topic but I really like your web page layout. Nice web page, I recently came across it and I am already a fan. I recently shed 30 pounds in 30 days, and I want to share my weight loss success with as many people as possible. If I can lose the weight then any one can. No matter what you do, never give up and you WILL achieve every one of your weight loss objectives! I must say, I enjoy reading your site. Maybe you could let me know how I can subscribing with it ? Also just thought I would tell you I found your page through yahoo. I don’t agree with everything in this article, but you do make some very good points. Im very interested in this topic and I myself do alot of research as well. Either way it was a well thoughtout and nice read so I figured I would leave you a comment. Feel free to check out my website sometime and let me know what you think. Stumbled across your post via a Google search. I found your posting pretty insightful. Hello, merci pour cet article. bonne continuation. Jogging is always a good thing for me, breathing fresh air on early morning. Loved to do that especially when my hubby is with me. Fall brings great weather for running outside, but as the days get colder and darker, it’s important to dress properly while on enjoying yourself jogging. 1. I have tried a few weight loss programs over the years. What that work best for me are 30 minutes of cardio combined with moderate and healthy eating. What I loved the most was your explanation about breathing and its importance. Most people don`t breath almost at all when jogging and just chat with their friends. The right breathing is however the most vital aspect of jogging or walking to flush your body with oxygen, train your heart properly and get rid of acid residues. Lastly, it is responsible for the relaxation one experiences after a good run. With the right rythm, where the pace is totally aligned to the rythm of breath, one makes sure not to get in to an unaerobic state. Thus, it is a great prevention against high blood pressure. Thank you for your post and enjoy your run!